Fun. lead singer Nate Ruess says the band's successful year has taught him "that I need to take better care of myself." 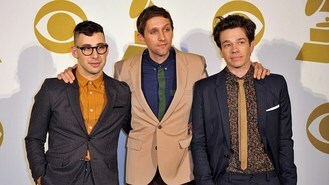 The trio, which includes guitarist Jack Antonoff and keyboardist Andrew Dost, has been on a wild ride since its dark pop-rock sophomore album, Some Nights, was released last February. They performed at an inaugural ball for President Barack Obama, and had one of last year's biggest anthems with the six-time platinum Number 1 hit, We Are Young. The group's second single and title track is a multiplatinum radio smash, and their album is near platinum status with 958,675 units sold, according to Nielsen SoundScan. But Nate, 30, said: "(The year) really put us through the ringer as far as everything is concerned, and we didn't get a lot of sleep, so it was pretty rough. "But what was cool is that I quit smoking and I cut back on drinking and I just made sleep a priority - and I think that's what all of us did." Fun. is nominated for six awards, including best album, song and record of the year, and best new artist, at this year's Grammys, to air live on CBS from Los Angeles on February 10.